Let the search begin! 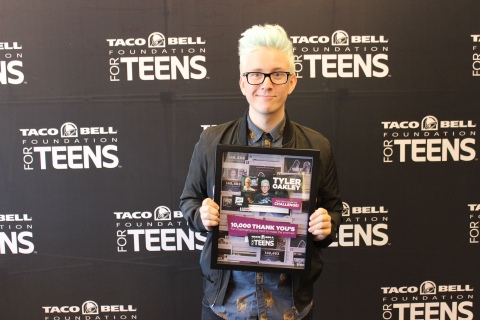 Today, Taco Bell(R) Foundation for TeensTM and its partner Get Schooled, together with celebrity ambassador and YouTube Sensation Tyler Oakley, kick off their first-ever “Graduate for M’asTM” Teen Scholar contest and are looking for one special high school student to fill the coveted position in 2015. To apply to be the next Teen Scholar, students are invited to make their promise to graduate and then submit a video entry at GraduateforMas.com explaining who they are, why they are a fit, and how they could help inspire their peers to graduate. Entries will be judged based on onscreen personality, ability to create content and engage with others, education and work ethic, and a passion to Live M’as. The student who is crowned as the new Teen Scholar will partake in a one-of-a-kind, yearlong journey as part of the Graduate for M’as program, receiving exclusive opportunities that will help them along a future career path, while inspiring the rest of America’s teens to achieve m’as. Not only will the winner receive a $30,000 scholarship and hold the elite title of Teen Scholar for the Foundation, but he/she will also earn the opportunity to participate in a Taco Bell television ad, will be featured on in-restaurant Point of Purchase materials, and will have the chance to collaborate with the Foundation’s celebrity partners throughout the year. The Teen Scholar program was established last year as a pilot program and included teens with whom the Foundation had existing relationships, including a Taco Bell restaurant employee. This year, the program is open to students across the entire United States and will provide even more access and greater opportunities. The Teen Scholar Contest runs from Wednesday, September 3 through Wednesday, September 17, and is hosted at GraduateforMas.com, where the Foundation and Get Schooled provide digital tools, support and an online community for students to stay on track. The winner will be announced in late September. For more information on the Taco Bell(R) Foundation for TeensTM, visit tacobellforteens.org. For information on the Graduate for M’asTM program and the Teen Scholar Video Contest Official Rules, visit GraduateforMas.com. Taco Bell Foundation Inc., also known as Taco Bell Foundation for TeensTM, is a not-for-profit 501(c)(3) public benefit corporation committed to inspiring and enabling America’s teens to graduate from high school and achieve m’as through its programs, partnerships, and direct financial assistance. Since 1992, the Foundation has served over 2 million teens in 6,000 communities across the country where Taco Bell restaurants have a presence. Through the support of our customers, franchisees, employees and vendor-partners over the last 20 years, the Foundation has awarded more than $45 million in grants and scholarships focused on education and career readiness. For more information on the Foundation and its commitment to teens – Taco Bell team members, friends and future leaders – visit tacobellforteens.org, and find us on Facebook at http://www.facebook.com/TacoBell4Teens. Taco Bell Corp., a subsidiary of Yum! Brands, Inc., (NYSE:YUM) , is the nation’s leading Mexican-inspired quick service restaurant. Taco Bell serves made to order and customizable tacos, burritos, and specialties such as the exclusive Doritos(R) Locos Tacos, gourmet- inspired Cantina Power Menu and lower calorie Fresco Menu. The company encourages customers to “Live M’as,” both through its food and in ways such as its Feed The Beat(R) music program and its not-for-profit organization, the Taco Bell Foundation for TeensTM. Taco Bell and its more than 350 franchise organizations have nearly 6,000 restaurants across the United States that proudly serve more than 36 million customers every week.